Simmons's BeautySleep brand is synonymous with affordable quality. 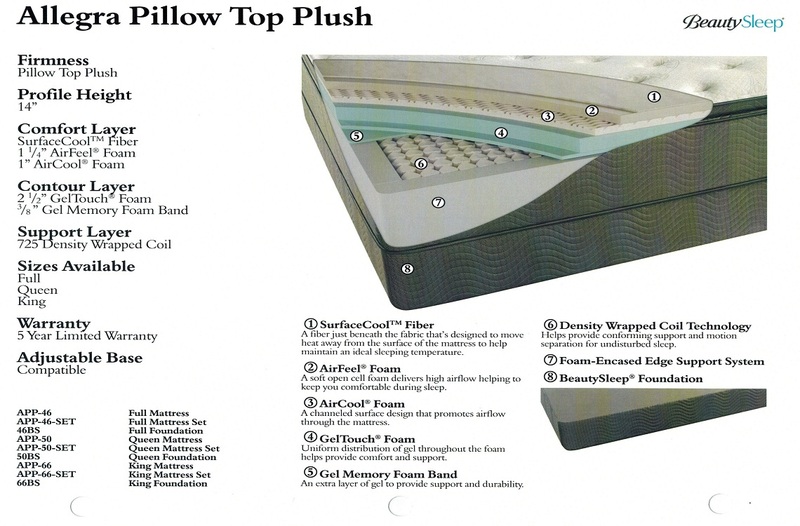 A fantastic value, the "Allegra Plush Pillow Top" is the ideal solution for those of you who seek a super soft/plush mattress. In addition to breathable (cooler) AirFeel, AirCool, Plush Comfort and GelTouch foams, the Allegra also adds an AirCool Memory Foam Center Third Support; offering additional body-contouring and support where you need it the most! The dense foam encased edges all-but eliminate motion transfer. 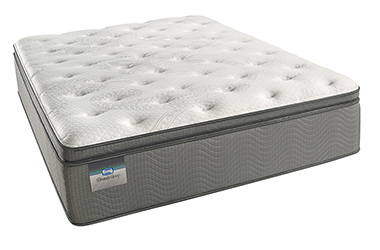 Add in the Simmons 700 Series Wrapped Coil and you've got a sturdy, luxuriosly soft and stable sleep system. There are still plenty of mattress shoppers who seek a 'super soft' sleeping solution but, poor craftsmanship by lesser brands in recent years has shyed them away from buying a mattress that's referred to as an "Extra Plush". The first thing we noticed when introducing the "Allegra Plush Pillow Top" to our sales floor was how difficult it was to carry there; this is a heavy, well-built mattress that does away with the myth that a soft mattress can't hold up, long-term! In this mid-priced/high luxury mattress model, there are almost four inches of patented CertiPUR-US foams between your body and the 700 Series Wrapped Coil. These are also more breathable foams (AirFeel, AirCool and GelTouch) which means that you'll probably sleep cooler in this bed than you do in your current one. Additionally, it contains AirCool Memory Foam in the center-third area, to provide you with more support. I, personally am not a fan of a plush mattress but even I can see and feel the quality in this one. That speaks volumes for the Allegra. The BeautySleep line by Simmons has always been a carrier of great value. You'll get the best materials, latest technology and superior craftsmanship - without the hefty price tag that you'd expect. For a true Plush feel, this model may be the best model that we offer. That's significant once you consider how many mattress models we carry. 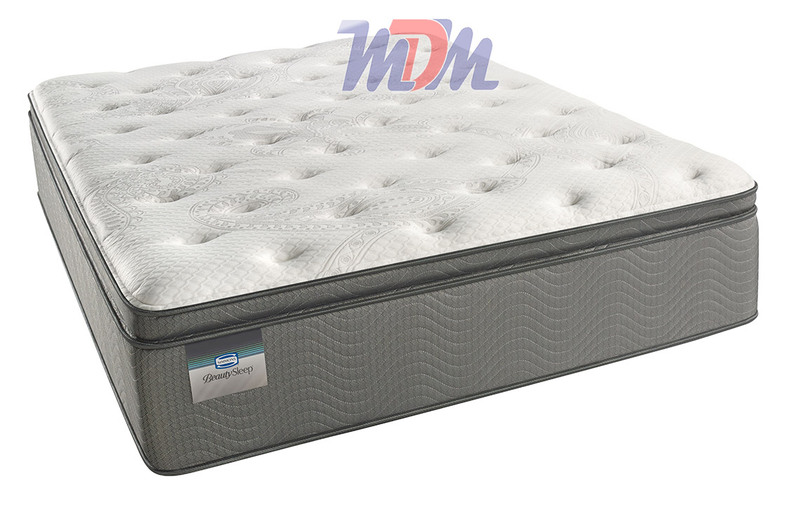 I recommend this model for those who absolutely love a soft and pillow-like sleeping experience but, who require the support that Simmons's strong pocket coil innerspring system offers. For a similar mattress with a 14% higher coil count and a slightly thicker buildup of layers, have a look at the Offshore Mist Plush Pillow Top by Simmons Beautyrest.